The One Dollar Gold denomination was the result of the Gold Rush in California beginning in 1849. The nation's mints began producing large quantities of gold dollars, which circulated mostly on the West Coast but gained acceptance nationwide. Breen comments in his Complete Encyclopedia that from 1849 through 1854 "gold dollars formed the bulk of the nation's legal circulating medium between the 3c and the $2.50 denominations". It was a fast accepted alternative to private bank notes and store scripts, that where made when the value of gold and silver fluctuated. 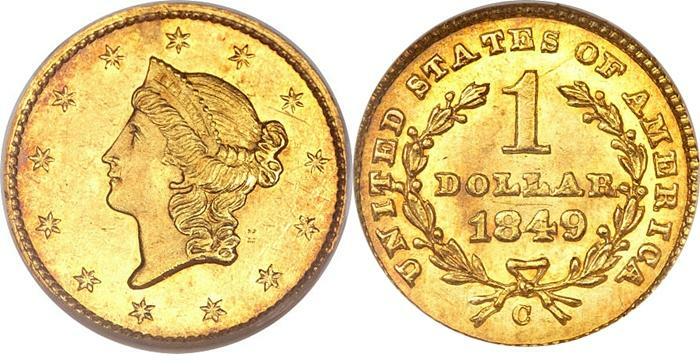 The One Dollar Gold coins were not worth the effort of melting compared to the Eagle Gold coinage, but their size made them easily dropped and lost, prompting the US Mint to issue a thinner but a larger diameter Gold Dollar. 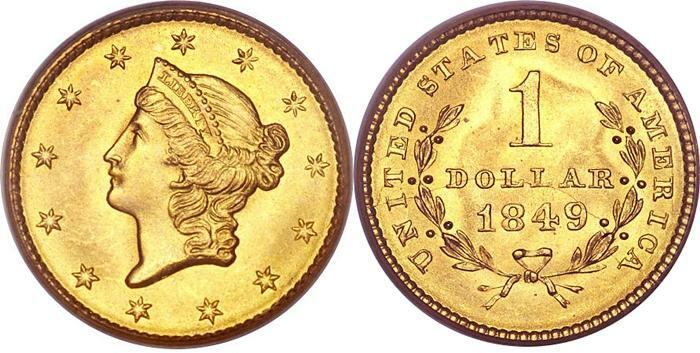 The US Mint did just that, in 1854, and it's now referred to as a Type II Gold Dollar. The new gold coin featured an Indian Princess in a feathered headdress with two reverse types, Open Wreath and Closed Wreath reverses, just as it's Liberty Gold Dollar counterpart. Heritage Auctions comments, "Mint Director Snowden requested the new design from his talented engraver, James Longacre, along with a "bigger sister," the three dollar gold piece. Longacre intended the image of Liberty as a Romanesque version of the classic Venus (from a marble statue he saw in a Philadelphia museum) but the public saw the headdress and a classic was named. In fact, it became the inspiration for the Indian cent. The new-style gold dollar, however, lasted only a matter of months. The government's set exchange rate--the ratio of gold to silver--could not be maintained, constantly threatening all gold pieces with private melting for profit. Many gold dollars struck during the period of this type's manufacture (less than two years) failed to survive the decade, accounting in part for their rarity today. The style was elegant, a deft rendering of Liberty in her feathered bonnet, in noticeable high relief, but as Breen says, "The coins proved unsatisfactory from the beginning. Longacre had miscalculated, overestimating the power of the coining presses then in use." It was a sheer manufacturing problem, especially for the Southern mints, which used older presses discarded by the main facility at Philadelphia. The coins most often were poorly struck, with weak features that wore quickly in use. Many were officially melted. The final type of this denomination, made beginning late in 1856, was the same size but in lower relief yet more deeply engraved, making the coins easier to produce with full details, and therefore they would endure far longer. What did not endure, in any number, were the Type Two issues--most of them unsharp to begin with, easily worn, largely melted and recoined into the new type." Some high grade and well struck examples were saved from the "melting pot" and circulation, and these rare examples demand lofty premiums.